Clear quartz is arguably the most important crystal in crystal therapy, and is sometimes referred to as the Master Crystal, Master Healer, or the Overseer. 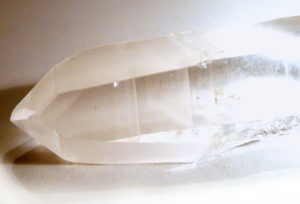 Many crystal healers use quartz points as wands to amplify, direct and transmit energy, as generators to enhance energy, or as control/personal crystals to direct the healing session, almost like a conductor with a baton. 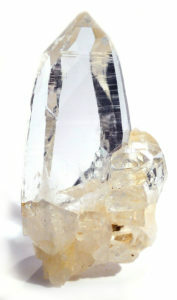 Quartz (silica) is the main component of glass, and can symbolise clarity. It is used in computer chips, and as such symbolises transmission of knowledge. The crystals have no centre of symmetry, which creates a polarity (piezoelectricity); slices taken at appropriate thicknesses and orientation are used for controlling frequencies in radio components and watches, making it a transmitter and controller of energy. 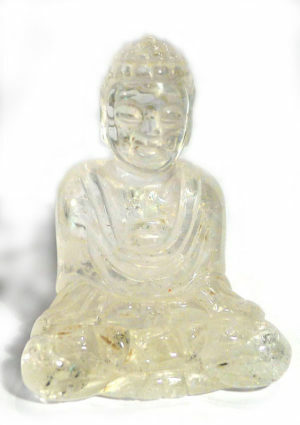 Clear quartz clears and focuses the mind, to aid both decision-making and meditation, and represents neutrality. It enhances and strengthens the healing properties of other crystals, and directs and amplifies healing energy to the area in which it is needed. 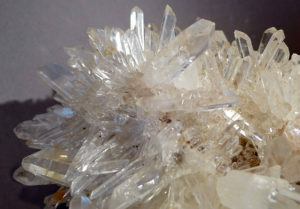 Quartz creates a strong connection with the Divine, and can clear the aura, as well as stimulating growth on a cellular level. Just as clear (white) light, when passed through a prism, breaks down into its component colours – the entire rainbow of visible light frequency – clear quartz epitomises the potential of all colours, all chakras, and all aspects of healing. There are many varieties of crystal shapes, each with their own use and symbolic meaning. Quartz is one of the most abundant minerals on Earth. Members of the quartz species are the most frequently used crystals in healing. Quartz crystals are usually igneous (volcanic), forming as plutonite rocks, which extrude beneath the surface of the Earth, but quartz also occurs in all silica-rich sedimentary and metamorphic rocks. 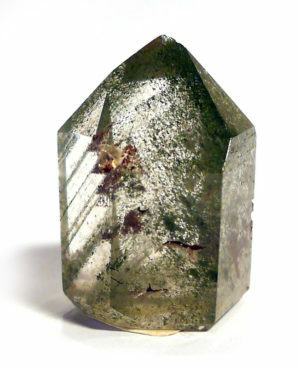 Crystals form with a pillar of six clearly defined faces, coming (usually) to a single termination (or point), also of six faces – although this may vary with the condition under which the crystal formed. Crystals having a termination at each end (known as double-terminated or DT) are also known. Because of piezoelectricity in quartz, slices of appropriate thickness and orientation are used to control frequencies in radios and watches. It is also used as a semi-conductor, and has formed the base material for computer microchips. In both cases it has largely been replaced by synthetic rock crystal. The name derives from the German Quarz (of uncertain origin, but possibly from an old German mining term). The word ‘crystal’ comes from the Greek, krystalos. The ancient Greeks believed clear quartz was water that had frozen so solidly it would never become liquid again – a belief that persisted (as ‘petrified ice’) through to the 12th century. Quartz has been carved into functional vessels, spheres and ornaments since antiquity (from at least 3,000 years ago), and its optical properties led to its extensive use in lenses and prisms, before being replaced by high-quality glass. Quartz crystal balls have been used for skrying (crystal gazing) since the Middle Ages, if not earlier. Quartz is not widely mentioned in early medical treatises, but Hildegard von Bingen (12th century) recommends it for treating eye problems and swellings around the neck and throat. 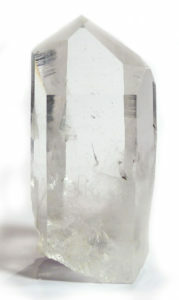 She also advises drinking a crystal essence using quartz with wine to treat stomach ailments. In each case, she instructs the user to heat the stone in the sun before using.